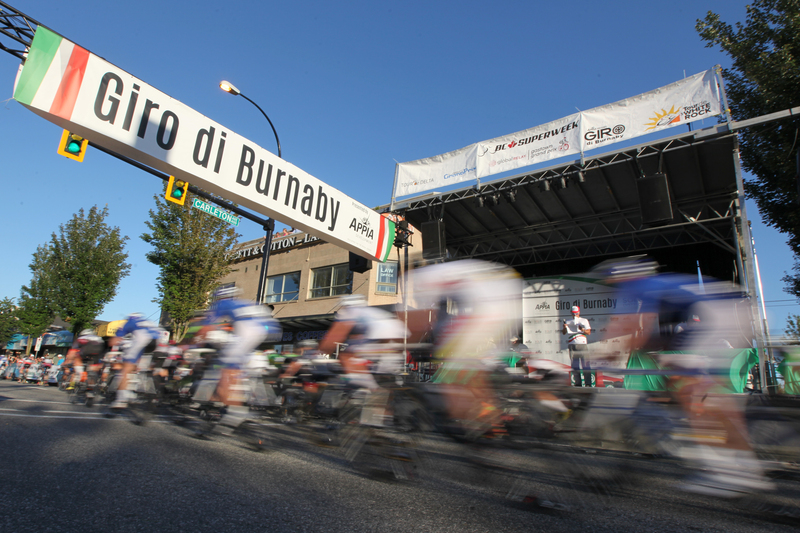 Criterium racing is the most action-packed, spectator-friendly form of bicycle road racing consisting of many laps on a course no longer than 2km in length and rarely lasting more than 90 minutes. The race is a chess match of strategy played at high speeds. Teams must decide whether their best chance of a victory is in keeping the field together for a mass sprint to the finish line on the last lap, or whether they are best served by getting a strong rider into a smaller breakaway group of racers. Of course, rival teams have different strategies and must adapt to the tactics and counter-tactics around them – all at speeds of up to 60 km/hr. View this high speed, high intensity race from a corner to see over 100 riders lean their bikes into a sharp turn while riding shoulder-to-shoulder or watch at the start/finish line to see the ultra-fast sprint specialists go for cash lap prizes (called primes). Many other locations on the course will put you within a few feet of the riders at full speed, just keep your hands behind the barriers! Why is everyone racing in a tight bunch? Riders are able to go faster and save energy by drafting one another, benefiting from a similar kind of pull that Nascar racers get by drafting each other. When the cyclists are stretched out that means that the racers at the front of the pack are really going fast and that the rest of the field are drafting off those riders, while struggling to stay together. When the racers are bunched up, that means that the pack has slowed down, but that is when a breakaway is most likely to happen! What's going on in a 'Breakaway'? Racers will use this tactic of riding away from the pack, to keep the outcome of the race from being determined by a dangerous mass sprint. Many breakaways fail because the main pack works together to chase them down. Corners, however, can help a breakaway survive because they generally slow a pack down more than they do a small group. Either way, breakaways typically include some riders who are going for the win as well as support riders making sure their team is represented in case the break stays away. Yes. Riders are part of a team with one or two designated “leaders,” or riders capable of winning the race. The rest of the team protects the leaders from crashes, keeps them at the front of the pack, and positions them for the final sprint. How do I know who's winning? The winner is the first rider across the line at the end of the race. So nobody’s really winning unless there’s a breakaway group of riders pulling away from the pack. What's with all the bell ringing? The bell signals to racers and spectators that there will be a sprint contest (or “prime,” pronounced preem) for money or prizes when racers cross the start/finish line on the NEXT lap. 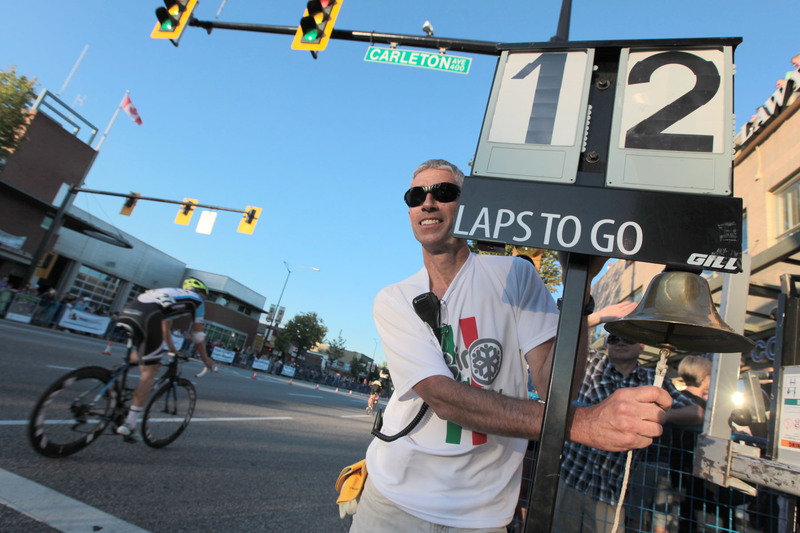 Spectators, including local businesses that would like some exposure, can donate a prize by handing the announcer cash during the race. Primes don’t have an effect on the final standings, but racers love to compete for them. It creates a sprint within the race and causes the speed of the whole pack to increase, making it more exciting and challenging. Is the race safe to watch? For the safety of the spectators and racers, please obey the race marshals at all times and cross at the designated crossing points along the course. Bikes and pace cars can exceed speeds of 60km/h and the road is reserved at all times during the course of the evening just for them. Enjoy the race and please keep your hands and any other objects well inside the fencing.